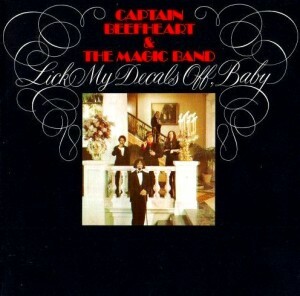 Captain Beefheart is an acquired taste. He approaches the blues from the outside in: Straddling the avant-garde, forgoing at times the “mama heartbeat” rhythm so germane to pop, his freak-outs range from musical free fall (e.g., the superficially untutored Trout Mask Replica) to gutter-garage (e.g., Safe As Milk).1 The overall effect is instructive if not wholly satisfying. Rarely does the Magic Band transcend a self-conscious sense of experimentation. 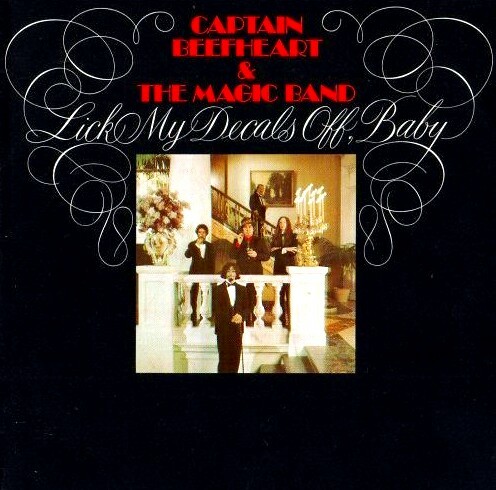 On Lick My Decals Off, Baby, Beefheart checks the lengths and limits to which Trout Mask travels, never losing its playful edge. Small concessions to pop elucidate and inform the weirdness. (1969’s Trout Mask was only the blueprint.) To most ears this is still inaccessible, but I like the miniature epics and the way his production pushes the interplay of the band up front. Gone is the tinny sound of the other album. Gone is the jokey redundancy. Decals is tight — it works as a record — but I’m surprised it’s only available on vinyl here in the U.S.2 To not flank Trout Mask with the fuller-sounding, much more compact Decals robs them of the context they deserve. They invite a fresh perspective on each other’s merits. They’re companion pieces. 1Of the Beefheart I’ve heard, Clear Spot (1972) comes closest to dancing with the mainstream. However, its blues-rock mutation uses the Trout Mask tongue. The mutation on Safe As Milk (1967) reacts mostly to the British Invasion. 2Rhino has a nice 180-gram edition.